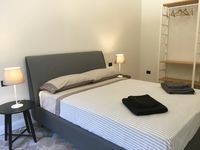 Superior Apartment in Monte Urpinu city park .Modern, cozy, new. Property 4: Superior Apartment in Monte Urpinu city park .Modern, cozy, new. Jungle Suite, design loft with garden in the city center. Property 18: Jungle Suite, design loft with garden in the city center. Beautiful new penthouse with a breathtaking and unique view of Cagliari. Property 22: Beautiful new penthouse with a breathtaking and unique view of Cagliari. Cozy and colorful apartment 700 meters from the sea for up to 5 people. Property 34: Cozy and colorful apartment 700 meters from the sea for up to 5 people. Property 36: Cosy & comfortable apartment in Cagliari, with parking space. Very elegant apartment, 18th century building. Marina waterfront. Property 42: Very elegant apartment, 18th century building. Marina waterfront. Apartment with large porch near the sea. Property 47: Apartment with large porch near the sea. We thoroughly enjoyed a week in Sardinia with the flat as our home base. Truly a lovely, spacious place to stay with comfortable bedding, towels, furniture, and ample kitchen ware. The bathroom and kitchen are modern and well designed. Although only one flight up, the elevator was a bonus. The location was great, easy walking distance to the harbor or up to the city center. Restaurants and local shopping were nearby. We missed having WiFi and a bit more information about using features such as the washing machine would have been helpful. Massimo was very responsive to questions during our stay. Although we arrived at midnight, Theresa was there to greet us with a smile. We would definitely stay here again. Our time in Anna's lovely apartment was perfect. We enjoyed the comforts of home, while being able to explore Cagliari. Anna was welcoming, kind, and extremely hospitable throughout our stay. She answered questions and always made herself available for help, etc. Traveling abroad with a toddler can be hard, but Anna's apartment was well-equipped to handle our two-year-old. We felt safe and happy to have our little one running around. We enjoyed the gorgeous views from the terrace, the welcome bottles of wine and fruits, and all of the amenities in the apartment. Grazie mille, Anna. We are so grateful to you!